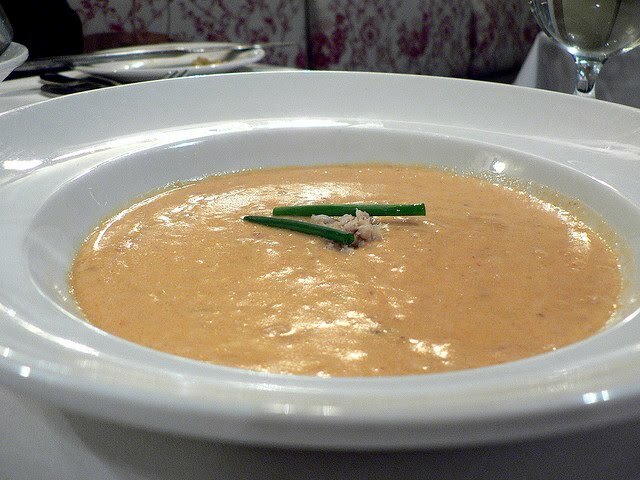 A stalwart in Seattle for over 30 years, Chandler's Crabhouse perfected this recipe for a simple, perfect crab soup. Clean crab and remove meat from shells, reserving shells. Wrap meat and refrigerate. Use shells to prepare crab stock. In large heavy saucepan, make a roux by melting ½ cup butter over medium heat. When the foam subsides, add flour all at once. Stirring constantly, reduce heat to low and cook, stirring, until mixture is blond colored, about 5 minutes. Add crab stock, a cup at a time, whisking thoroughly after each addition. Bring to boil, reduce heat and simmer 20 minutes, skimming frequently. Add whipping cream, lemon juice, hot sauce, Worcestershire sauce, Old Bay seasoning and white pepper; bring back to a simmer and cook 10 minutes. Add whiskey, sherry, remaining 2 tablespoons butter and reserved crab meat, and cook 1 minute to heat through. Season with salt and ladle into bowls. In heavy stockpot, heat olive oil; add crab shells, carrot, onion and celery, and brown lightly. Add brandy and ignite. When flames have expired, add water, garlic, bay leaf, tarragon, and tomato paste. Bring stock to a low simmer and cook 2 to 3 hours, occasionally skimming off any scum that rises to the surface. Remove from heat and strain mixture through fine sieve. Refrigerate until ready to use.